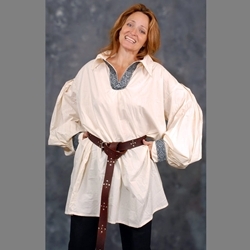 This attractive loose fitting and light weight Renaissance shirt comes decorated with a metalic trim at neck and cuffs. Makes a great addition to your Renaissance garb and can be worn by men or women. Open at the collar and ties at the wrists. This renaissance shirt is slightly longer than our standard renaissance shirts. Natural and White from 100% Cotton, colors from poly/cotton blend. Belts not included. Dry Clean only. Made in the USA.